What Honda proudly refers to as the most refined Accord in its 2018 lineup arrives at dealerships March 23. What makes the latest Accord superior to the outgoing offering? Read on. Say what you will about the redesigned from the pavement up 2018 Honda Accord. There’s been a great debate raging in the auto press as to which car constitutes the best, or greatest value, when comparing front runners Honda Accord and Toyota Camry. Read my initial Camry Hybrid impressions here. I’ve driven both. And, while I do appreciate what Toyota’s done to take its bread and butter midsize family sedan to the next level in refinement, and sport, I tip my hat to 2018 Honda Accord for superior overall packaging. Without question Honda Accord offers the best appointed driver-centric cockpit design in the segment. 2018 Honda Accord Hybrid with a base model MSRP of $25,100, (plus $890 destination charge, tax and license) comes to market March 23 priced $4,405 less than the outgoing model, and $2800 less than a comparably equipped Toyota Camry Hybrid. By lowering the MSRP, Honda expands the demographic price appeal and affordability of Accord Hybrid. 2018 Honda Accord Hybrid is the lowest priced and most powerful 5 place, midsize, 4 door hybrid sedan ever offered by the maker. Furthermore, in a move to meet or beat dealership demand while producing a wider availability of trim options, the historically manufactured in Japan Accord Hybrid will now be produced in Ohio -- this should increase hybrid sales. For 2018, consumers will discover a more powerful, better standard equipped Accord Hybrid. 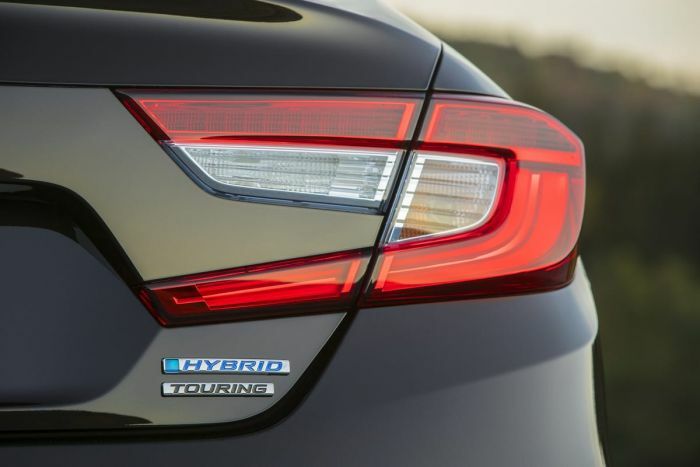 Furthermore, “the 2018 Accord Hybrid is powered by the third generation of Honda's innovative two-motor hybrid powertrain, which pairs a 2.0-liter DOHC i-VTEC® Atkinson-cycle inline-4 engine with 40-percent thermal efficiency to an electric propulsion motor that churns out 232 lb.-ft. of torque for a class-leading total system output of 212 horsepower.” “As before, the Accord two-motor system operates without the need for a conventional automatic transmission.,” says Honda. For 2018, Honda expands hybrid trim options with 5 trim variants, 2 more options than the outgoing year. Trim options include, Hybrid, EX,(new) EX-L, EX-L Navi,(new) and Touring. This is good news for the “Green” minded consumer that looks for a bit of “premium,” from their low environmental footprint personal transportation. Last Fall,while attending the 2018 Honda Accord press reveal in New Hampshire, I spent some time behind the wheel of Honda’s latest and greatest Accord Hybrid. Read my initial observations and predictions for Honda’s made in Ohio Accord Hybrid. Two key features will soon “normalize” the hybrid car in North America. 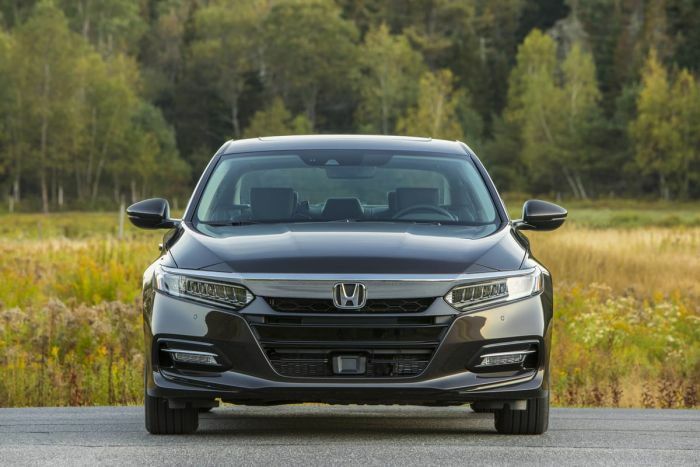 In conclusion: I look to 2018 Honda Accord Hybrid to carry forward the Honda Hybrid tradition, while presenting superior personal electronics ease of connectivity, and standard equipped exceptional driver assist and active accident avoidance safety features. Me, I simply enjoy the drive and feel of a well built gasoline, electric hybrid car or crossover. I recommend a 2018 Honda Accord Hybrid test drive to anyone considering the purchase of an electrified vehicle. For those of you that want a bit more, check out Honda Clarity here. Here’s your model trim walk and MSRP. Photo Attributions American Honda Motors 2018.